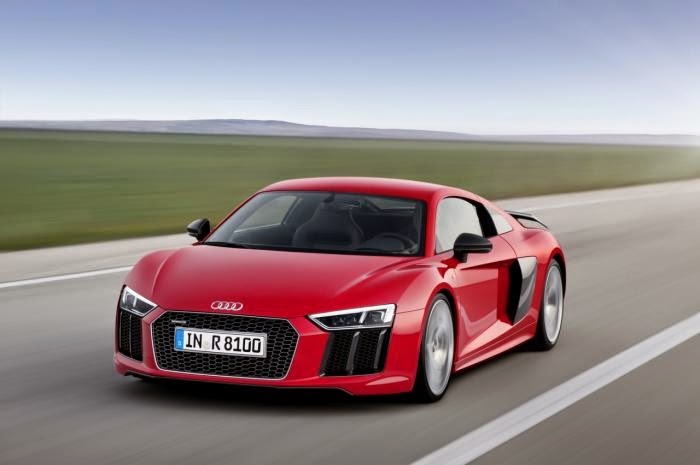 The 2015 Audi R8 e-tron electric supercar will have 340 kW of power and a remarkable 920 Nm of torque, sprint from 0-100 km/h in 3.9 seconds and offer a range in excess of 450 km. The second-generation of Audi’s halo product will have more than doubles the range over the original small-batch model thanks to an increase in battery capacity from 49 kWh to approximately 92 kWh. Energy density has increased from 84 Wh/kg to 154 Wh/kg apparently without the 600 kg battery affecting packaging. The battery powered R8 has a Combined Charging System (CCS) on board, which allows charging with direct and alternating current. Using this system, it is possible to fully charge the battery in significantly less than two hours. The rear wheels are powered by two electric motors with specs uprated from 381 HP (280 kW) and 820 Nm (605 lb-ft) to 462 HP (340 kW) and 920 Nm (679 lb-ft). It's enough electric power to provide the Audi R8 e-tron 2.0 with a 0-62 mph (0-100 km/h) time of 3.9 seconds before hitting an electronically-capped top speed of 155 mph (250 km/h). Audi says targeted torque vectoring, which it describes as "needs-based distribution of power transmission between the rear wheels" ensures maximum dynamics and stability. Audi says the new R8 e-tron serves "primarily as a mobile high-tech laboratory" that will eventually feed into technology used in a high-volume sedan — but in the meantime, if you've got the time and the money, the Germans are willing to build you one by hand. Hopefully we'll see the car on display in Geneva next week.